It is generally known that our founder, George Booth, named our community “Cranbrook” after the Booth’s ancestral home in Kent, England. Even the portion of the Rouge River which flows through the property was called the “Crane” by the Booth family. I’m certain that Booth must have been aware of the derivation of the Cranbrook name, which began with the Old English words “cran broc” which means “crane marsh.” The spelling, which evolved over time from Cranebroca to Cranebroc then Cranebrok, eventually became Cranbrooke. 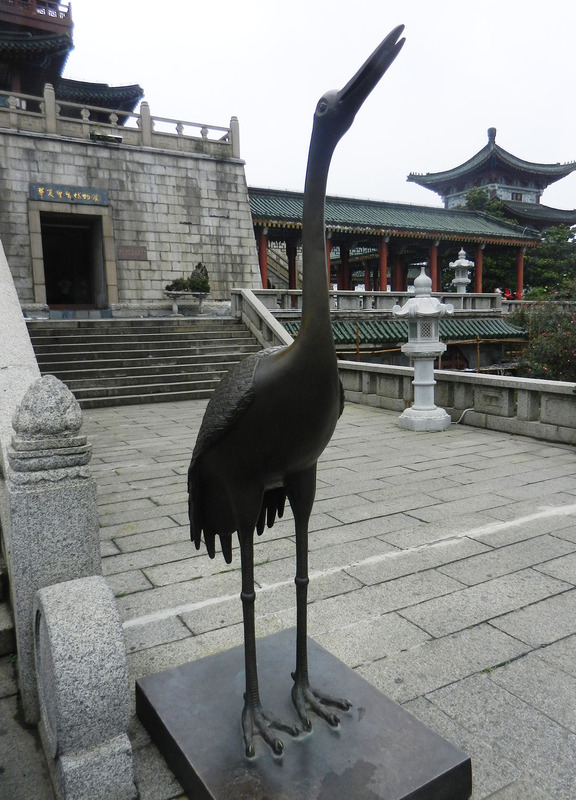 On a recent trip to China, I was surprised when I saw large bronze cranes at the Teng Wang Pavilion in Jiangxi province’s capital city of Nanchang. They reminded me of the crane iconography at Cranbrook. While I had previously noticed the use of cranes as a subject in Chinese paintings, I never really thought about their meaning. The Chinese have a symbol for everything including life, death, and immortality. Our guide informed us that the crane symbolizes good health, longevity, and auspiciousness to the Chinese people. Photo taken at Teng Wang Pavilion, Nanchang, China, Jun 2017. Courtesy of the author. A crane can also represent happiness and a soaring spirit. A crane that is shown outstretched wings and one leg raised stands for longevity while one shown flying towards the sun is illustrative of a wish or hope for social advancement. There is even a form of martial arts called the “White Crane Style” originated by the female martial artist Fang Qi Niang during the Qing Dynasty. Back to Cranbrook! References to cranes have been widely used over the past 100 years, many in relation to Cranbrook School. Perhaps the most obvious is the use of The Crane as the title for the Cranbrook School for Boys school newspaper, which won by popular vote at the first meeting of the School League in 1928. (Today the paper is known as The Crane-Clarion since the merger with Kingswood School in 1985.) Below are block prints by Cranbrook School students found on the covers of the 1928 papers. In mid-March 1930, The Crane switched to a new format and instead of being mimeographed, was printed by The Cranbrook Press at the Academy of Art. To go along with this new format, a logo for the paper was designed, likely by art editor Alfred Davock. The bronze crane inserts for the dining hall chairs for Cranbrook School (designed by Eero Saarinen) are still in use today. Henry Scripps Booth used the symbol of the crane as a directional marker on his architectural drawings. The Academy of Art Administration Building (designed by Swanson and Booth) features a crane brick pattern on the south façade of the building, and Eliel Saarinen designed two “bird motifs” for the bottom of the stairs at the First Arts and Crafts building. The drawings, in the collection of Cranbrook Archives, show Saarinen’s plan to use light and dark bluestone to delineate the body of the cranes with red slate for the eyes and black slate for the beaks. As recently as 1994, Katherine McCoy, co-chair of the Academy’s design department, developed the current Cranbrook community logo which features a contemporary symbol of the crane rising out of a large “C” for Cranbrook. It is shown below, alongside a humorous 1930 illustration for a column heading in The Crane. While Cranbrook’s history with the crane may not be as long-standing as that of the Chinese, one might argue that we, too, have incorporated the crane into our community’s culture as a symbol not only of longevity, but one of respect for the legacy of our founders and our community’s heritage.